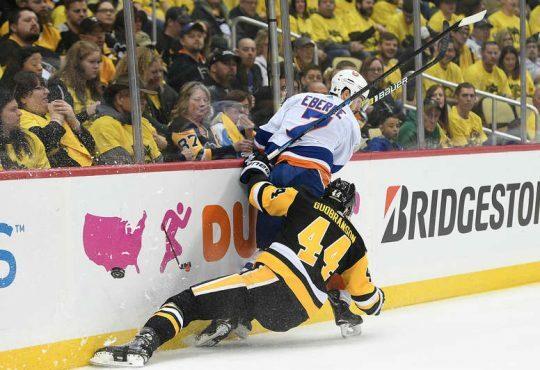 Every week of the 2018-19 season, our Rob Taub will discuss one player from the Islanders to look out for. Whether it’s past performances, certain matchups, or something about that player that makes worth spotlighting, each article will describe why they are being featured. Also — if one, two players, or the team is coming off a good week — there will be multiple spotlights. 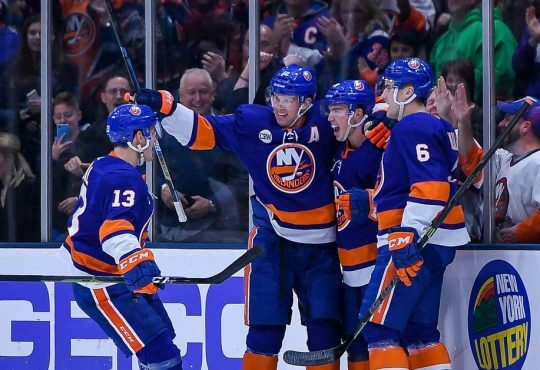 On Saturday night, the Islanders secured its first postseason berth for the first time since 2015-16. The forward, whose goal eventually turned out to be the game-winner, notched his fourth point in four periods. That forward was Jordan Eberle. 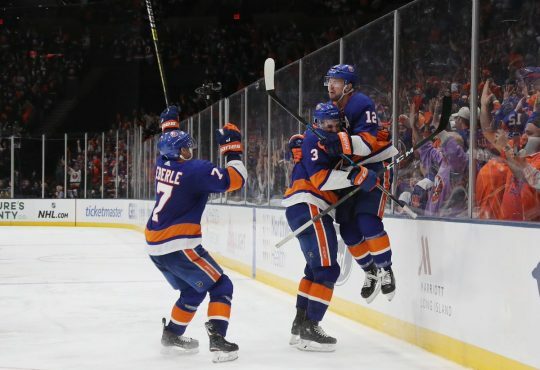 Since being placed on a line with a familiar face — Mathew Barzal — and captain Anders Lee, Eberle has shown more of a nose for the net and is making smarter decisions. He’s got four goals in his last four games and five points overall. It’s safe to say though that the 28-year old has experienced an up and down campaign this year. Some of his struggles could be attributed to him just being a late bloomer to adjusting to head coach Barry Trotz’ new defensive structure. Before Trotz took over behind the bench, Eberle was a part of an Edmonton Oilers system that emphasized offense over defense seven seasons. 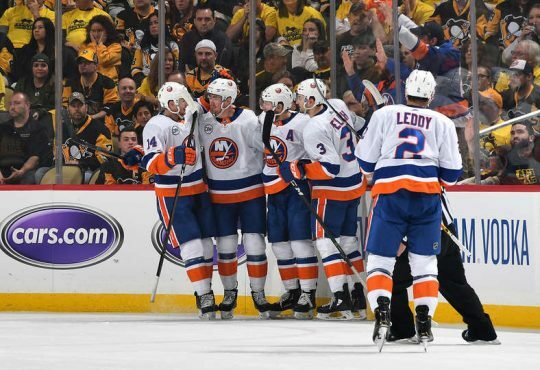 It didn’t help that as a part of the Islanders last season under Doug Weight, the team had no concept defensively and banked on just outscoring the opponent to win games. What also might have plagued the winger this year is his ability to bury opportunities. Eberle is still on pace for 20 goals for a sixth consecutive season — he sits at 18 with three games remaining — but there have been numerous times where he’s had the puck on his tape and couldn’t find the back of the net. According to hockey-reference.com, Eberle has a shooting percentage of 11.5% through 78 games this season. That’s the third lowest of total of his career and a hefty decrease from his percentage last season, 13.7%. Team-wise, Eberle’s shooting percentage ranks him eighth among the skaters while his 156 shots put him fifth. Not terrible numbers, but definitely a regression from a year ago where he scored 25 goals on 183 total shots. Up until the last few games, Eberle had been matched with Lee and Brock Nelson for most of the season. Their line had some success, but Eberle was the weak link of the group. It’s interesting that was the case because Nelson is one of the more skilled players the Islanders have in its forward corps. The same goes for Lee, except he uses his bigger frame to create space. And we saw a year ago how much Eberle flourishes with heavy-skilled players around him. 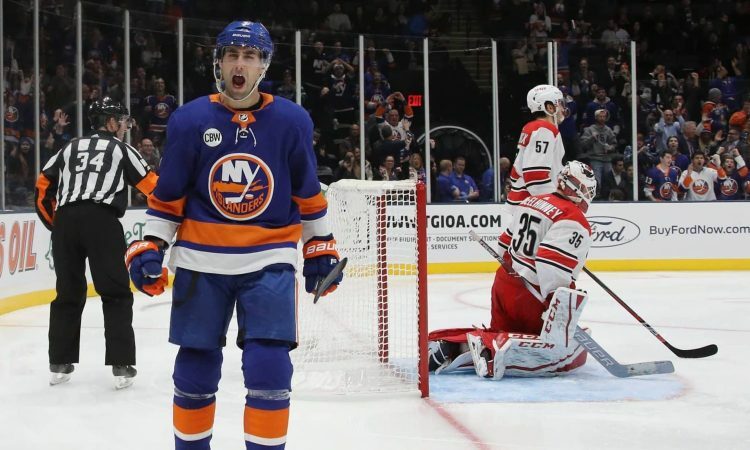 When he was placed on a line with Barzal and Anthony Beauvillier to start the second half post-All-Star break, the trio ascended as the Isles most prolific line and one of scariest in the league. The three definitely fed off each other and looked like they would be the go-to guys when this season got underway. Instead, Trotz has placed Eberle and his fellow B’s together for 2.1% of the through the whole season, that from leftwinglock.com. But transitioning back to the present, Eberle looks primed to turn an underwhelming campaign into hopefully a big playoff run; more than that, a possible contract extension. Eberle is in the final year of six-year, $36 million dollar contract and will no doubt be looking for the same amount or more come July 1. It’s hard to predict right now whether g.m. Lou Lamoriello is going to pony up the money to pay him when the organization has some wingers, Oliver Wahlstrom, Kieffer Bellows, potentially waiting in the wings. The lure of possibly grabbing superstar winger Artemi Panarin or Jeff Skinner will play into the decision on whether to re-up with Eberle. What also might not help Eberle’s situation is the organization needing to get both Lee and Nelson signed. But, if Eberle helps the Islanders advance a few rounds, that could no doubt change some minds of the teams’ brass. There should be no messing around from Eberle when the Islanders start postseason play either next Wednesday or Thursday. He only got to experience the playoffs once in his seven years with the Oilers. During that team’s run to the seventh game of the Western Conference Semifinals in 2017, Eberle sputtered with just two points in 13 games. His performance basically sealed his fate in Edmonton, to where a few months later the Isles acquired him in a one-for-one deal for another play who underachieved, Ryan Strome. So it goes without saying, Eberle will not squander his second shot at playing in the springtime. Right now though, Eberle is riding as a good a five-game stretch as he has all season. Last Sunday, he tallied the game-winner not even five minutes in against the Coyotes off a heads up play from his linemate Barzal. Take out Tuesday’s defeat in Columbus, Eberle played his best game of the season in Winnipeg last Thursday. He set up Barzal beautifully to get the Islanders back into the contest after they trailed early 2-0; scored before the ten-minute mark of the third to get the team within one of tying the game; used his patience to wait out Connor Hellebuyck to pot the eventual game-winner with 1:13 remaining. He added his third game-winner in four games in the aforementioned clincher for the Isles in their 5-1 victory. It might only be five games, but Eberle looks like he’s rediscovered his game. His chemistry with Barzal is undeniable and the two just know where to be at all times. 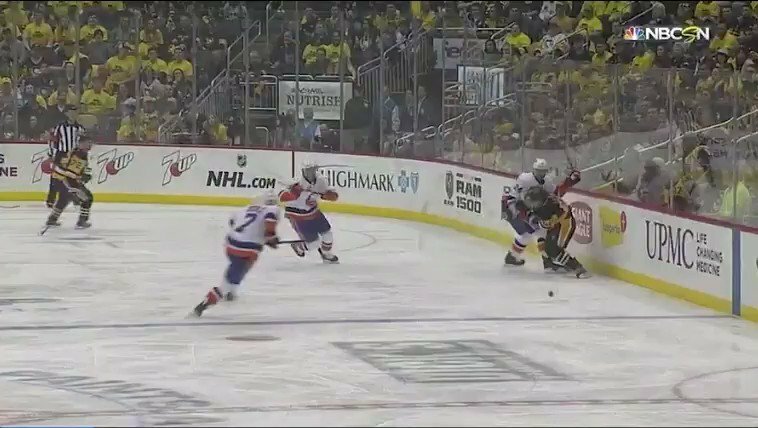 Eberle looks more confident with the puck and has looked more defensively sound. The power play — and it goes for the team as a whole — is the only spot where if Eberle could start having an impact, can really provide another dynamic. With the postseason right around the corner, Eberle could not have picked a better time to get hot. The Islanders are going to need him to do damage if they want its magical ride of a season to continue. And if that happens, it could possibly lead to a long spring into summer on Long Island.